Here's a Deadspin article called "Gambling Hot Streaks are Actually Real." It's about a study by academic researchers in London who examined the win/loss patterns of online sports bettors. The more wagers in a row a client won, the more likely he was to also win his next bet. That is: gamblers appear to exhibit the proverbial "hot hand." Keeping in mind the principle of "if it seems too good to be true, it probably is," you can probably think for a minute and come up with an idea of what might really be going on. As the authors note, bettors are not actually beating the bookies in their subsequent wagers -- it's just that they're choosing bets that are easier to win. What the authors find interesting, as psychologists, is the pattern. They conclude that after winning a few wagers in a row, the bettors become more conservative, and after losing a few in a row, they become more aggressive. They suggest that the bettors must believe in the "Gambler's Fallacy," that after a bunch of losses, they're due for a win, and after a bunch of wins, they're due for a loss. That is: they take fewer chances when they think the Fallacy is working against them. But, why assume that the bettors are changing their behavior? Shouldn't the obvious assumption be that it's selective sampling, that bettors on a winning streak had *always* been backing favorites? Some bettors like long shots, and lose many in a row. Some bettors like favorites, and win many in a row. It's not that people bet on favorites because they're on winning streaks -- it's that they're on winning streaks because they bet on favorites! Imagine that there are only two types of bettors, aggressive and conservative. Aggressives bet longshots and win 20% of the time; conservatives bet on favorites and win 80% of the time. It seems pretty obvious that's what must be happening. But wait, it's even more obvious when you look closer at the study. It turns out the authors combined three different sports into a single database: horse racing, greyhound racing, and soccer. A soccer game result has three possibilities -- win, lose, draw -- so the odds (before vigorish) have to average 2:1. On the other hand, if there are 11 horses in a race, the odds have to average 10:1. Well, there you go! The results probably aren't even a difference between "aggressives" and "conservatives". It's probably that some bettors wager only on soccer, some wager only on racing, and it's the soccer bettors who are much more likely to win five in a row! There's strong evidence of that kind of "bimodality" in the data. The authors reported that, overall, bettors won 48% of their wagers -- but at average odds of 7:1. That doesn't make sense, right? 48% should be more like even money. I suspect the authors just used a simple average of the odds numbers. They took a trifecta, with 500:1 odds, and a soccer match, with 1:1 odds, and came up with an simple average of 250:1. The bigger the spread in the odds, the worse the simple average works. So, the fact that 48% is so far from 7:1 is an indication that they're mixing heavy favorites with extreme longshots. Well, actually, we don't need that indication -- they authors report that the SD of the odds was 38. Finally, if none of that made sense, here's an analogy for what's going on. I study people who have a five year streak of eating lox and bagels. I discover that, in Year Six, they're much more likely to celebrate Hanukkah than people who don't have such a streak. Should I conclude that eating lox and bagels makes people convert to Judaism? I had seen the Deadspin article earlier and when I came across your writeup here, my initial reaction was "no way, the authors must have controlled for previous bet odds". Going back and re-reading, I'm actually convinced you are right ... this was just overlooked. "Shouldn't the obvious assumption be that it's selective sampling, that bettors on a winning streak had *always* been backing favorites?" that would be an obvious assumption, but it's something the authors explicitly checked for! Maybe they are not as dumb as you think. 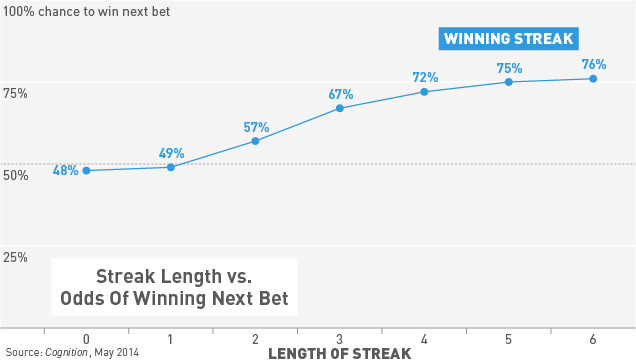 Bettors with long winning streaks did not win any more often than those without. In addition, they show in Fig. 2 that bettors are actually choosing less and less risky bets after each win (or more and more risky after each loss). So they are more actively picking the favorite after each successive win (and, again, vice versa), which explains why they are winning more and more. Their interpretation appears correct, yours does not. Where do the authors say the bettors with long winning streaks did not win their bets any more *often* than those without? I was only able to find where they say those bettors did not win any more *money*. Man, I'm staying away from lox and bagels from now on. Thanks for the heads up! I checked Baseball Reference: Despite playing three games there in 2003, Tim Salmon never smoked one in Philadelphia. He didn't even put up a bagel, getting at least one hit in each of the games. It's too bad ... otherwise, he'd be a lox for the Hall of Fame. Possibly the dumbest published research I have ever read. Gamblers who were losing bet less but with higher odds (trying to get their money back with the higher odds bets, but probably having a lot less money to bet, thus the smaller bets). Gamblers who were winning bet more (they presumably have more money to bet) but at smaller odds. Incredible. I have no idea why all the discussion about gambler’s fallacy and the hot hand effect.